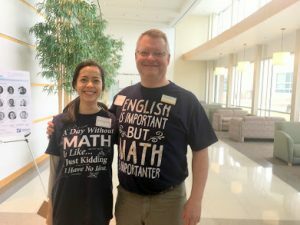 The VMATYC Glenn Fox memorial Mathematics and Computer Science Scholarship Committee is seeking qualified applicants for the 2019-2020 academic year. The scholarship award is for $500 per semester. Applicants must intend to major in mathematics, computer science, or mathematics education and demonstrate potential for success in any of these areas. Preference will be given to those candidates who intend to teach mathematics or computer science. Applicants must complete the application below and provide unofficial transcripts, and two letters of recommendation. Applications are due no later than June 15, 2019. Intend to major in mathematics, computer science, or mathematics education and demonstrate potential for success in any of these areas. Demonstrate ability, determination, and motivation necessary for successful academic performance. Have completed at least 12 semester hours of college-level courses, including 3 hours of transfer mathematics at a Virginia community college, by the end of the spring semester with a GPA of 3.2 or higher. Continue for two semesters (fall-spring of the award year) at a Virginia community college and enroll in at least 6 semester hours of college-level courses, including a transfer-level mathematics course, for each semester the scholarship is received. Include unofficial transcripts of all college courses through Spring semester, 2019.